3 April 2012: After a few days of watching the Tubes working, I have some observations about them. This is an expensive way to learn, incidentally. My little One-square-metre of tubes should really be facing south as they do little when the sun isn't shining. The arrangement of East+West may be OK for water tank heating, but for ground heating, more tubes are required, and they should face south. The context here is of heating without using a Heat Exchanger - there is a solar controller setting for heating swimming pools, and our ground is like a very large cold swimming pool. I am still convinced that Tubes could be used for heating the ground, but there is a matter of 'critical mass'. The size of the array needs to be larger - that seems obvious, but how much larger? Well at the moment, the array warms up, and the pump starts, and at the slowest pump rate it flushes out all the warm liquid in a couple of mins. If the flow total only 200 or 300 litres a day flow, then the pipes should be very narrow to give that warmed liquid a chance of getting down to the ground loop. I fear that some of it sits in the pipes within the house, dependent on insulation, probably getting more heat from the house than from the tubes. If the sun is shining, the 1-metre long array flows a few minutes and nearly meets a steady state - depends on how cold the ground loop has been - but the flow of incoming cold liquid forces down the temperature of the rooftop sensor too quickly, until the pump turns off. The current settings are that the roof sensor has to be 8 degs higher than the ground, then it starts, and runs until the ground and roof sensors are equal. So would the critical mass be 2 metres of tubes? Would that be enough to keep the pump flowing without turning off? I think not. More are needed! There must come a point where the tubes alone could do it without a heat exchanger, but perhaps it would need to be be 4 metres of tubes (i.e. 8 square metres). This is difficult to model on a computer, and it seems that a live installation is the only way to test it so that you are absolutely sure. If the length of the array is enough to keep the flow going, then one could manage without a heat exchanger, because the warmed liquid would have time to get down to the ground. This number of tubes would be expensive. Standard tube manifolds are 1 and 2m long, so for a start, a minimum system would have to be the larger size, perhaps two of them. Very expensive. A heat exchanger will be ordered. This is usually for when you have immiscible liquids that must transfer heat, such as glycol through the solar panel and swimming pool water in the other loop. In our case, its value would be in thermal inertia, enabling the tube loop to work continuously. 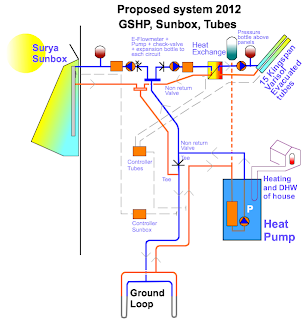 The loop that takes the heat to the ground would become intermittent, drawing heat down, but turning off when that was achieved, without having cooled the block enough to turn off the tube loop. There is only so much you can do with 2 square metres of tube, but this is a way of getting the warmed liquid to travel further down to the ground loop to where it is needed. Hi! I am very interested in if you attract a lot of traffic to this journal? Hi, we average about 200 a day, which is 6000 a month. 120,000 since the end of 2009. I know it's kind of acedemic now but it sounds like the control system and pump was designed to heat a small water tank rather than a large body of water. I don't have any expertise at all in this field (in any actually) but I can't help feeling that there is a way. What i'm thinking of is that the temperature could be used to control a variable speed pump. That is let say you set it to twenty degrees and the higher temperature is above that the faster the pump goes and as it approaches twenty degrees the slower it goes. I like your system and am gradually figuring out how it all works. nice work.